Am I crazy about zucchini breads or what? Ever since I started baking them (which is only a few weeks back), I can't stop thinking what to put in next and how to improve them. 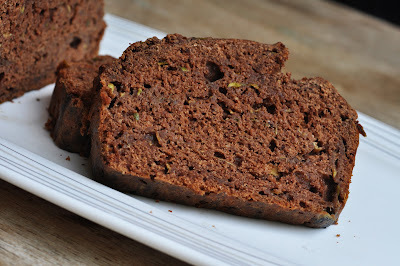 I think this will be my last zucchini bread post for this season, and I made some significant changes to my other zucchini breads (check here for my Apple Zucchini Cake with Walnuts and my Chocolate Zucchini Spelt Cake). First of all, this one is vegan. For quite some time I wanted to see, what a flax seed and water mixture does to a cake in order to replace eggs. It definitely needs more experimenting, but in this cake it works well. I must admit, it was a safe try for this substitution with all the mashed bananas on the ingredients list. Bananas are a good egg substitute too, when it comes to cake baking. However, the bananas are helping out on another side as well: I tried to substitute the amount of sugar/agave syrup from my other zucchini bread recipes with mashed bananas. What else can I say than that I can't stop eating this cake? In fact, I had to stock up on milk (which I normally don't drink in such copious amounts) to go with a slice or two of this cake. It's yummy, it's moist, it's chocolate, and it's healthy, it's so full of good things to be any main meal of the day. In a large bowl, combine ground flax seeds with warm water. Let stand until it becomes like gel, about 10 minutes. I fit doesn't, pour the mixture into a small pot and let simmer for a couple of minutes. Sift together flour, baking powder, baking soda, salt, and cocoa powder. Set aside. When flax seed water mixture has combined, whisk in agave syrup, olive oil and mashed bananas. Combine dry ingredients with wet ingredients. Stir in the grated zucchinis. Pour batter into prepared loaf tin. Bake for about 45 minutes or until cake tester comes out clean. Let cool in the tin for 10 minutes. Then take out and let cool completely on rack.